there is a small botanical garden at the Yorkshire Museum. 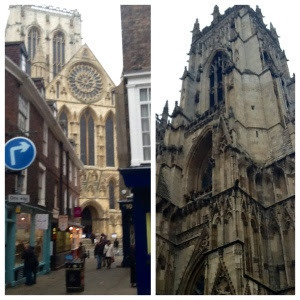 to see the famous York Minster Cathedral. 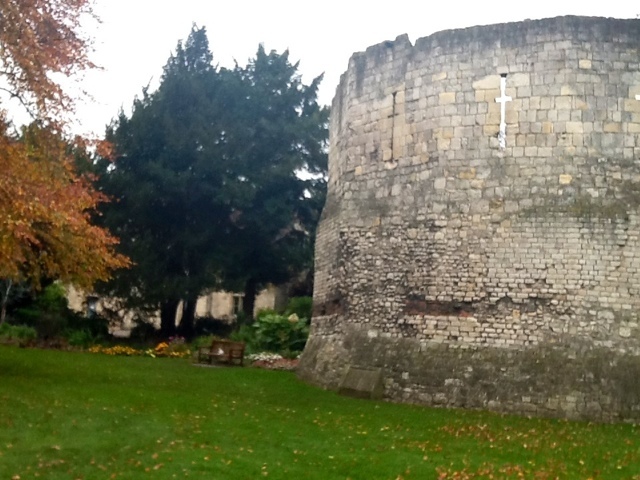 The museum (above) and gardens are situated next to the River Ouse. The property is both beautiful and haunting at the same time. 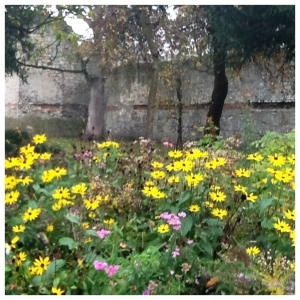 The museum grounds, like this medieval walled city, has an ancient past stretching over two millennia. The above photos show remnants of the corner tower of a Roman fortress built in 70 AD and rebuilt in the 3rd or 4th centuries. It was cloudy and gray the day I visited, and there was a chill in the air. The leaves were the colors of gold and orange during the first week of November; still, I had the chance to see some of the last bright blooms of the season. and interesting architecture. The stone ground floor of the above Hospitium building is medieval, while the timber-styled first floor was rebuilt in the 20th century. And yet, what I remember most from one year ago is not a stately tree or a striking bloom, but stone wall remains from an old abbey building. St. Mary's Abbey was built in 1088. 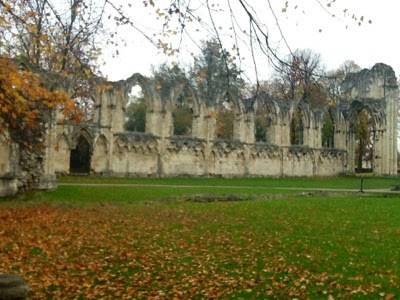 It was once a wealthy and powerful Benedictine monastery. It was a treat to see this ancient wall, with gorgeous archways, framed by colorful and even bare trees. What a stunning backdrop for a botanical garden. But that's the point where things got a little spooky. Just behind the abbey wall there is an old graveyard on the back property of St. Olave's church. 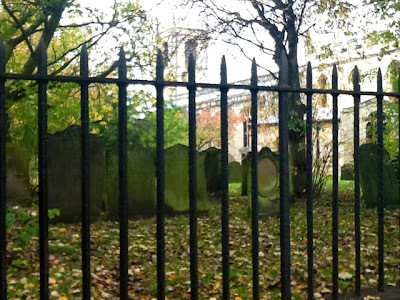 It was littered with fallen leaves and separated from the garden by a black, spiky wrought iron fence. It was as if Vincent Price was going to jump out from behind a tombstone to say "BOO" and then do that scary laugh. It was quite a sight. 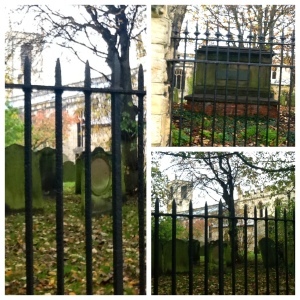 I was looking at a sarcophagus and lots of tombstones. Some were tilting, and all of them were dirty from age and covered with green mossy growth. Perhaps it does fit right in with the ruins on these hallowed grounds with remnants of buildings constructed about a thousand years ago. 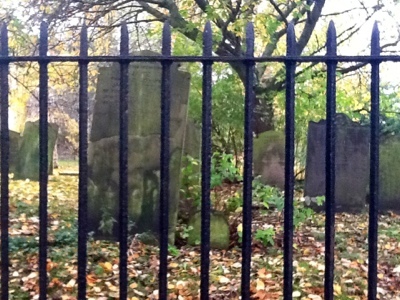 That's when the dirt, moss and shadows on some of the tombstones started to play tricks on my eyes and my imagination. 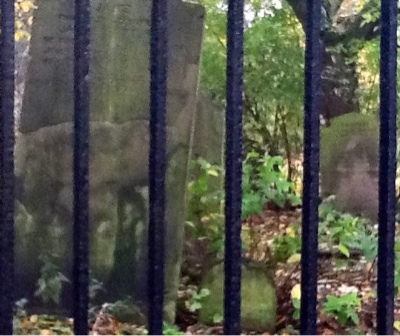 I saw ghost-like outlines of faces on these two tombstones. While I sit here writing I also see a small, slender woman in a long black dress on the right side of the front tombstone. My husband sees a woman in a wedding dress in the back tombstone. Now, I am haunted by all four of the ghosts. 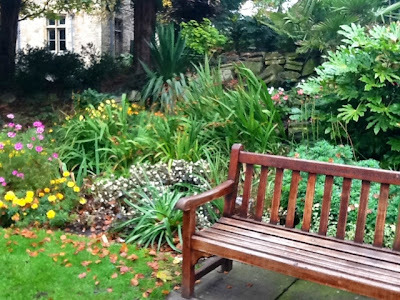 So what better time to visit the Yorkshire Museum Gardens than on All Hallows' Eve, October 31st, or Dia De Los Muertos, Novermber 1-- the day my Mexican friends celebrate the "Day Of The Dead." I wish you more treats than tricks and a Happy Halloween! Truly fascinating! I see both the woman in the black dress on the front tombstone and the other woman in a white dress on the back tombstone! There is so much history there. 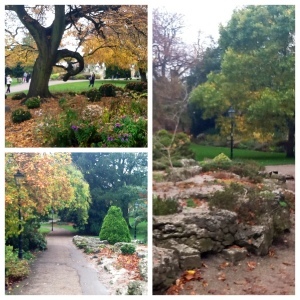 That is a beautiful garden to spend a day in. Viewing so many gardens What a quest to be on. Your photographs show how hard landscaping can enhance the more natural beauty of plants. Jeannine, I always get so excited when I see that you did another post about a garden in England. And for sure I didn't get disappointed. 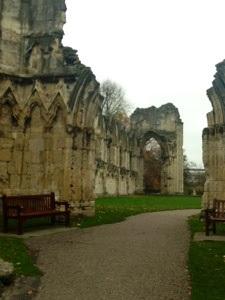 The ruins of the St. Mary's Abbey are very beautiful and fascinating. Just thinking of a building that was built in 1088 and the remains are still there makes my spine tingling. Thanks for sharing!